I love how bizarre the jokes are in Murray the Nut. This comic makes me want to be hypnotized. Also reminds me of the opening video to Parasite Eve (which I giggled maniacally through). Ha! That is pretty funny, dude. Man, I LOVE that last panel. Awesome! 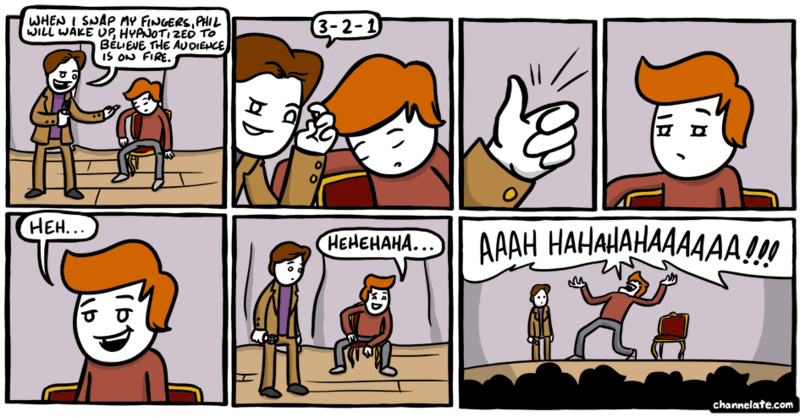 LOL… man, I would love to see a hypnotist show like that. This blog is great. I have found profitable information from this blog. I like its comments. thanks for info. A reliable informative post that you have shared and appreciate your work for sharing the information. Jz1T0Y This is one awesome article post.Really looking forward to read more. Keep writing. We are famous in the leather industry with our best quality of leather and its stuff we are providing service from all over the world with shipping specially free shipping in the USA, CANADA, AUSTRALIA, and the UK we have our official website. Successfully i have read your all the articles on this blog and they are very helpful. Thank you. feed me more buddy, you post less but they are outstanding post. Thanks and keep posing man. i have to share this post on my blog because on my blog people are asking for this topic, thanks for it. Thanks for sharing so much information in this regard. I have no found such a committed story that you have mentioned. Thanks for your working in this regards. Nice pics and nice story really made me laugh when I saw it I really like the creativity, I am a big fan of Avengers and would love to see comic story on Avengers End Game. This blog was… how do you say it? Relevant!! Finally, I have found something that helped me. I have desired to write about something like this on my webpage and you gave me a good idea. Cheers. 4VFsDS Thanks for sharing, this is a fantastic blog post.Really thank you! Keep writing. Just push on forward. You’ll get over her soon enough. I met a nice pretty girl this summer and. side of the country and say good bye. That. lol and read her blog daily It’s. xvKuc7 Very interesting info !Perfect just what I was looking for! Charity is injurious unless it helps the recipient to become independent of it. by John Davidson Rockefeller, Sr..